This time we look at how to create simple chord stab sound typically used in trance and house music. Create a simple three note chord sequence in your midi track. Enable operators E and F.
Set waveforms of both operators to 1+2+3 Saw waveform. To get that wide sound needed for the chord stabs we need to detune operators relatively to each other. First set both operators ratios to 1. Now add 0.0036 to the first operator’s ratio value and subtract the same value from the other. We could also detune operators by any other value we like. For my ears it works somewhere up to 0.0100 everything higher sounds out of tune. Now we can also detune the operators further with offset parameter where we can specify the exact amount of detuning in hertz. Set operators E offset to 0.30 Hz and operators F to -0.30 Hz. Route both outputs of the operators to filter and filter output to audio out. We will use lowpass filter with sharp envelope setting to give the sound that plucked character. 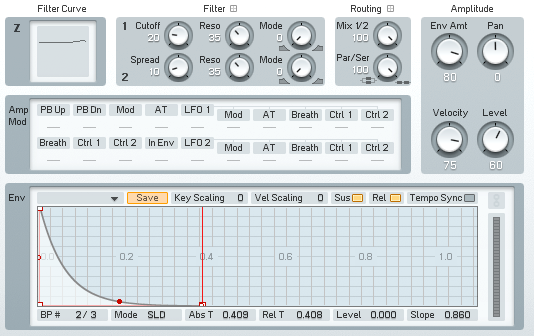 Set both resonance parameters to 35, filter to serial and mix to output 2. Set the envelope of the filter to something like this and raise envelope modulation amount to 80. Also set the velocity sensitivity to 75. We should also lower the default key scaling setting so the pitch of the played note wont affect the filter frequency that much. We want the notes in a chord to sound almost the same otherwise the upper ones are too bright. Go to the KeySc section of the FM8 and lower filter Z key scaling envelope. Go to the Master Section of the synth and set polyphony and Unision voices to 8. Also set the detune slider to 50 or even more. This will give the sound nice, fat character. To get some bite in the sound we should raise the self-oscillation amount of both operators to 44 or so. 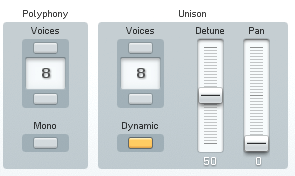 Also we should add some stereo spread and delay with Chorus/Delay effect in the effect section. You can also set the cutoff as a fixed setting and use velocity knob of the filter envelope instead. 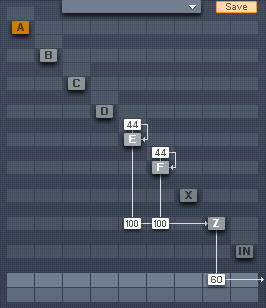 Here we go, this is basic chord stab in FM8. Another nice effect is to modulate the cutoff frequency of the filter with LFO. Go to the mod section of the synth. Enable LFO1 and route it to operator Z to control the filter cutoff. Set the modulation amount to 20. 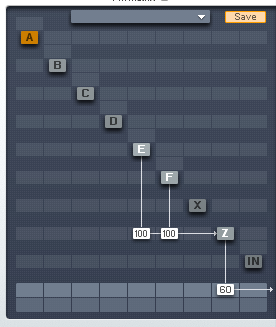 Set the LFO1 like in the picture below. Experiment with different LFO’s waveforms, rate, clock sync. Here are also few 4 bar variations of LFO1 with S&H waveform. This can produce some cool semi random effects. You should also reset the LFO1 with every new note played to keep modulation under control. You do that by enabling key sync button. Let’s also try some pitch modulation effect. Un-route the LFO1 from operator Z and route it to pitch with amount of 25 instead. Set it’s waveform to triangle and rate to 53. You can hear this produces some quite extreme de-tuning effect. Also we could raise ratio value in one of the operators for 2 so it will play two octaves higher making detuning effect more defined.